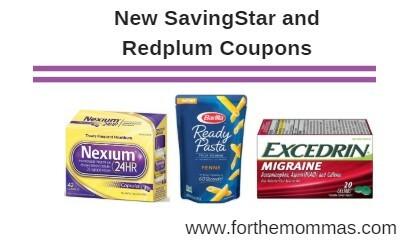 Today there is 5 NEW Redplum and 2 New SavingStar Coupons available to help you save on Excedrin, Nexium, Barilla and more. SAVE $2.00 off any ONE (1) Nexium® 24HR Product.Expires 5/7/2019.Save $2.00. SAVE $5.00 off ONE (1) 42 ct. Nexium® 24HR Product.Expires 4/21/2019.Save $5.00.